Frederick Law Olmsted, the landscape architect behind New York City's Central Park, is also responsible for designing Montreal's best known green space in the city—Mount Royal Park. More than 5 million people visit it every year, and it is the most frequented park in Montreal. In fact, the name of the city, "Montreal" is named after this small extinct volcano. Also, you may hear people call it Parc Mont-Royal in the bilingual French and English-speaking city of Montreal. 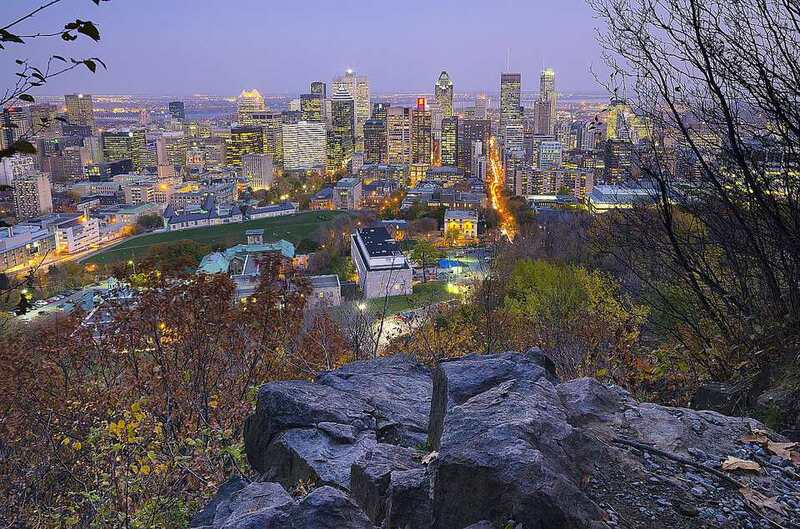 Its 470 acres offer some of the city's most stunning skyline views atop Mont-Royal's three peaks, the highest of which rises a modest 764 feet above sea level. One of those three peaks belongs to Summit Park. A visitor's must-see and a popular local treasure, Mount Royal Park is packed with free or affordable outdoor sports and activities for all ages, especially in winter months. And the grounds offer a few history lessons, too. The first European to scale the mountain was Jacques Cartier, guided there in 1535 by the people of the village of Hochelaga. He named the mount in honor of his patron, Francis I of France. The city had been called Ville-Marie, but, by the 18th century was going by Montreal. The park contains two belvederes or outlooks overlooking downtown Montreal. The more prominent Kondiaronk Belvedere features the Mount Royal Chalet, which can host parties of up to 700 people. From its peak, you can see the St. Lawrence River and the Montregian Hills. The Camillien-Houde belvedere offers a magnificent view of the east of Montreal. St. Joseph’s Observatory is another breathtaking spot from which to view the city. Beaver Lake is a small artificial lake, which freezes over for ice skating in the winter. Mont Royal is perfect for other winter activities like snow tubing, tobogganing, cross-country skiing, kick sledding, and snowshoeing. The lush forest was badly damaged by the ice storm of 1998 but has since largely recovered. The forest is known for its beautiful autumn foliage. You can take some nice winter forest treks through the terrain, both on your own and with a guide. Beaver Lake is also a good place for renting a rowboat or paddle boat during the warmer weather. You can go picnicking, walk or bike the trails, and go birdwatching. The gazebo acts as the bandstand for entertainment. The George Etienne Cartier Monument, named for one of Canada's founding fathers, is the place where "tams tams" take place. These giant drum circles start in the morning, ebb and flow with more and less percussive guests, and conclude by sundown. Reaching 100 feet in height, the Mont Royal illuminated cross was erected in 1924 and has since become one of Montreal’s most iconic landmarks. The International Sculpture Symposium is a collection of 11 sculptures by international artists dotting the landscape of the glades between Smith House (the visitor's building) and Beaver Lake. Cemeteries, and several adjacent parks and adjacent universities together make up the Mount Royal Natural and Historical District.